Search engine optimization has become all about impressing the search engines. For that, webmasters do whatever it takes to come on the favorable list of the search engines, even if they have to resort to some black-hat means. As a result, many webmasters are pushing some SEO techniques to their limits and trying to exploit the loopholes to manipulate the search rankings, and Google is one of their top targets. However, in the recent time, Google has changed itself a lot more than what we could see a few years back. In its path to make its SERPs relevant and useful to the end users, Google now puts some extra attention on the questionable links that manipulate the SERPs and degrade the search result quality. As a result, a huge number of websites get penalized either by Google's algorithmic penalty or manual penalty. If you are lucky, you might be on the safer side with just the algorithmic penalty. On the other hand, trust me you don't want to get into the Google's manual penalty scoop. Google takes over 400,000 manual actions each month according to Matt Cutts. So, a large number of websites fall into the manual scoop because of their questionable practices pushed to the limit. 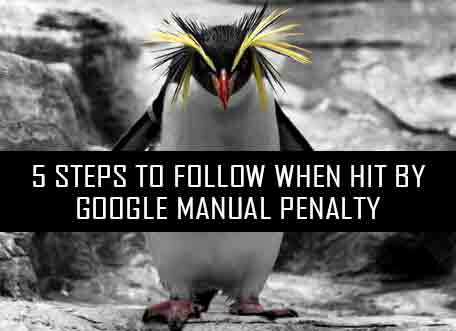 Have your website just received a Google manual penalty? Don't panic because I am going to show what you need to do to recover your lost ranking from the penalty and get on the safer side by correcting your mistakes. If you have received such notification, sadly you are a victim of Google's manual penalty. Considering the situation, these 5 steps will help you to successfully remove the manual penalty and recover the rankings. As in the notification, you can easily see that suspicious links are the main cause of the penalty. To catch the links, you need to first collect a list of all the links that link to you from other websites. This is a huge task. You cannot do it manually. There are various tools that can help you to get this done, Google Webmaster Tools is one of them. After collecting the list of all the backlinks, you will know where they are coming from. Once you have a clear list of links and their sources, you can inspect them and find out which are bad links and which are not. Once you have a list of all the backlinks, the next job is to find the culprits. It’s recommended to organize the links on a spreadsheet where you can include two columns- ‘Links’, ‘Natural Or Bad’. You can them mark them as Natural Or safe based on your inspection. While there are various tools that can sue to inspect the links for you, it also recommended going through each link manually as automatic tools are not so reliable. It's a big job to inspect and catch the bad links, you don't want to leave any stone unturned. So, rely more on manual link checking for better inspection. Low quality, bad, or unnatural links generally come from low-quality sites. These sites can be identified with both automatic and manual inspection. They can be easily caught due to their non-adherence to the search engine guidelines. High quality or natural links can be identified by inspecting the uniqueness and relevance of the content. You must inspect what value the content is providing to the real users and what it provides additionally that are not there in other similar contents on the web. Check if the links are coming from scrapped, plagiarized, or poorly repurposed contents. Such contents are not valuable to the users and are identified as bad links by search engines. Check if the links are coming from sites with poorly handled Ads, careless interlinking, stuffed keywords, and other spam indicators. Those sites which have so many Ads that overshadow the main content are marked as low-quality sites by the Google. Once you have inspected the links and prepared a list of the backlinks which you want to remove, it’s time to contact the respective webmasters. Contact all the webmasters of the bad links linked to your site and request them to remove the links from their site. Be polite with your language. Contact them from your company's email address, not from your personal Gmail or other free email accounts. Say, johndone@yoursite.com. Try to get the name of the webmaster and use a personal salutation instead of “Dear webmaster”. Say, “Dear John Done”. Be clear and to the point with your message to make them understand your point easily. Explain what's going on; and why you are removing the link. Also be clear if you want to remove the link completely or just a Disavow is fine. Don’t follow up by bombarding the emails. A single email is enough to wait for the response for few days. However, there are few cases when you will need to do a follow-up. Some websites with spammy content may not easily be ready to help you. It may require doing several follow-ups to such websites. In this case, it is always recommended to keep a track of all the conversations and whom you have contacted. Once they remove the link, always re-check by manually verify it and then update your list. Disavowing is a process in which you tell Google to ignore a link from or to your site in its search ranking assessment. It means the Disavowed link will have for effect on your search ranking (neither positive nor negative). - Not all the webmasters may consider getting back to you in response your request. - You may have bad links appearing from the sites that are no longer active. In both the cases, you don’t have a control on what to do next to get the links removed. So, it’s safe and better to get rid of such links by Disavowing them using the Google’s Disavow Tool. Using this tool you can mark the links that would be ignored by Google while assessing your search ranking. You can mark the links for Disavowing by preparing a list of all the links in a ".text" format and then uploading it to your Google Webmaster Tools. Please note: Before you place a Disavow request, make sure you have cleaned all the possible bad and unnatural links by following the above steps. Disavowing is the last resort that you should adopt only for those links whom you were not removed by any other means. Also, if you find a site using rogue practices and not adhering to webmaster’s guidelines, it's better to Disavow the whole website instead of some particular page link. Google encourages the websites hit by a manual penalty to perform the cleaning and then submit a reconsideration request so that the penalty can be revoked after checking the site. Once you have completed all the 4 steps successfully and you are certain that you adhere to the webmaster's guidelines, you can submit a reconsideration request to Google. Use your Webmaster Tools to send a message to Google mentioning all the actions you have taken to fix the problems that caused manual penalty. Also, mention the changes that you have made to your SEO techniques and how they adhere to the Webmaster's Guidelines. It may take months to get a response from Google’s search quality team. They will manually check your site so it’s understandable. You can also place multiple reconsideration requests if you don’t get a response for a long time. It's not impossible to get rid of Google manual penalty. Many sites have recovered from it. With correct steps and white hat SEO getting rid of any Google penalty is perfectly possible. Follow the steps mentioned here, and get rid of bad backlinks, Google will certainly revoke the manual penalty. If you are not an expert in the SEO tactics, it's better to hire an SEO expert who can understand the guidelines and knows what needed to be done. Author Bio: Ethan Roy, a technical content writer by Profession. With years of experience on various eCommerce platforms (Magento, PrestaShop, OpenCart, Shopify), he has a lot to share with the readers. Currently working as Technical Content Writer at Velsof.